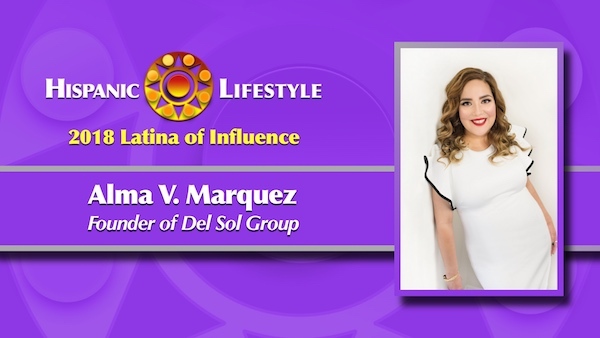 Hispanic Lifestyle is pleased to recognize Business Owner, Community Leader and Founder of La Comadre Alma V. Marquez as a 2018 Latina of Influence. Ms. Marquez along with our entire list of 2018 Latinas of Influence are invited to participate in Hispanic Lifestyle’s 2018 Latina Conference taking place April 4 and 5, 2018 in Ontario, California. Alma V. Marquez, Founder of Del Sol Group, has over 25 years of experience in finding solutions to complex problems and a vast network of allies locally and nationally. A highly regarded strategist and public affairs expert, Alma’s ability to envision and implement winning strategies and tactics has earned her a reputation as a game changer. Before founding Del Sol Group, Alma was Vice President of External and Government Affairs for Green Dot Public Schools, a national education reform organization that manages public charter schools. She led groundbreaking work there including political and community engagement efforts that grew Green Dot from 4 schools to 18 and the first two turn-around school projects in LAUSD’s history in Watts and South LA. She also led efforts for the Political Action Committee for the Small Schools Alliance, which insured that education was the mainstay of the Los Angeles Mayoral Race of 2005. Alma also served as the CA Latino Vote Director for President Obama’s campaign, where she developed innovative Latino Voter strategies including the “Obama Nos Llama” campaign. It was the first time that Latinos throughout California were organized to support Latino vote efforts in battleground states such as Nevada, Colorado, New Mexico, North Carolina, Texas and Florida. This strategy was implemented in the subsequent Presidential campaign. Alma served as an Advisor to the historic PBS documentary “Latinos 08” which captured the complexity of the Latino Vote in the United States, a demographic that so many continue to try to understand. Alma’s unique experience on the national level is built on her experience locally. At 14, she co-led efforts in her community against a toxic waste incinerator slated to be built across from her high school in Huntington Park, a working class community in Southeast Los Angeles. Winning despite insurmountable odds was a defining moment for her as it propelled her into public service, government relations and urban planning. While pursuing her Masters in Urban Planning at UCLA, Alma was honored with the HUD Community Builders Fellowship, one of 8 in the nation. She graduated from Occidental College where she earned a bachelor’s degree in Comparative Literary Studies and Politics. She is a proud product of California’s Community College system and credits her time at East LA College as pivotal in her personal development. Alma is proudly fluent in Spanish and English. She mastered the ability to translate simultaneously on the fly, which is a great source of pride for her father Armando. She brings a strong sense of commitment, ethics, and drive combined with a must-win attitude and a contagious sense of humor. I would also like to formally submit another nomination for Alma Vivian Marquez, CEO of Del Sol Group, Policy and Public Affairs firm. Ms. Marquez is an outstanding citizen who has led national efforts for presidential campaigns which is where I had the privilege to work under her leadership as she oversaw Latino Campaign efforts in Nevada for Presidential Campaign efforts. Where in 2008 her leadership efforts led to Nevada coming out in mass force for President Barack Obama. She has taken the time to teach communities about the political process, holding house meetings at her very own home as well as other massive efforts to teach community members about the political process and empower them to participate civically in their surrounding communities. In addition she is the founder of the educational blog La Comadre where diverse educational factors are explored and highlight with a focus on how current educational systems impact students of color. Last spring Ms. Marquez was awarded Woman of the Year by Women’s Club of Huntington Park, she was recognized by the community she comes from for her massive efforts to bring educational opportunities to Southeast Los Angeles. The broad range of her efforts range from coordinating Christmas toy giveaways for foster children that live in the community where she was raised to actively coordinating efforts to ensure more women of color run for office in all branches of government, local, regional, state and federal. She has done all of this while raising an incredible daughter all on her own. Please accept my humble nomination for one of the most humble deserving women doing the community work. There is no doubt in my mind Ms.Alma Marquez is a deserving of this wonderful honor from your outstanding Magazine!